Here’s a recent address for the Anaheim Mission. We try to keep this information up to date, but it’s a good idea to check the address with several sources, including your mission packet or the mission office. Here’s a list of LDS missionary blogs for the California Anaheim Mission. This list includes the missionary’s name, URL and when their blog was updated. 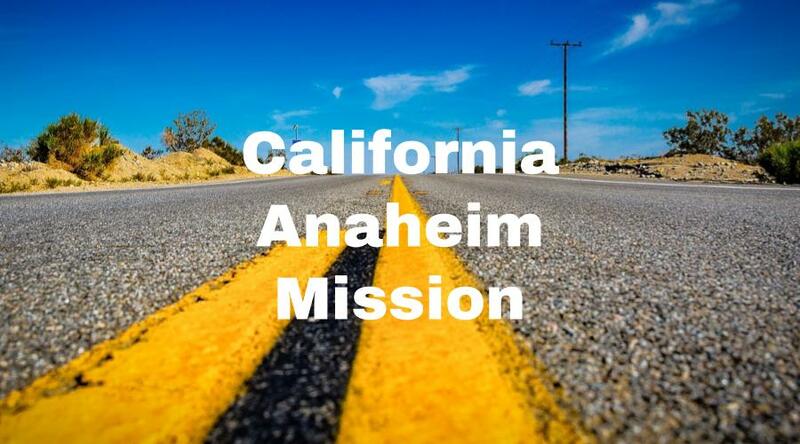 Here are California Anaheim Mission Groups- for LDS missionary moms, returned missionaries, mission presidents and other alumni of the Anaheim Mission. Here are T-shirts for the California Anaheim Mission! 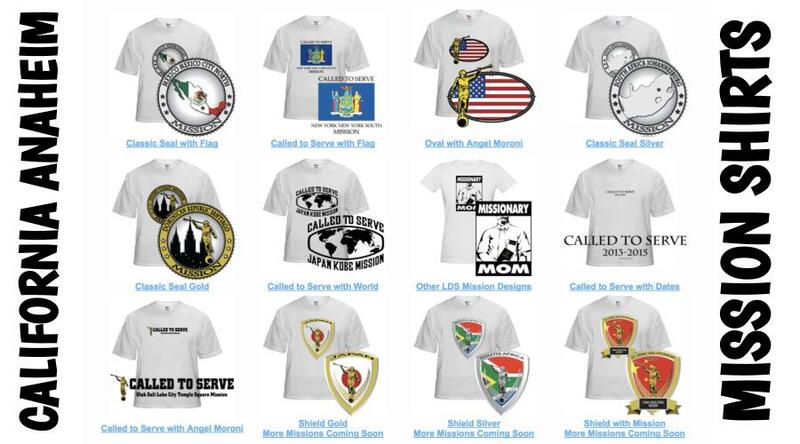 Shirt designs include California Anaheim Mission logo/emblem shirts and Called to Serve shirts. The shirts make great gifts for pre-missionaries, returned missionaries and missionaries currently serving. LDS Mission shirts come in all sizes: Small, Medium, Large, Extra Large, up to 4XL. The mission designs are printed on white shirts and are shipped to you. *Simply click on a shirt design to view the details and submit an order. The designs on mission t-shirts may also be printed on other LDS mission gifts, including: California Anaheim missionary aprons, Christmas stockings, ties, pillow cases, teddy bears and Christmas ornaments. Here’s a list of current and past Mission Presidents of the Anaheim LDS Mission. Here are survey responses from California Anaheim RMs, to give you a snapshot into what it’s like to live in the mission. What are some cool facts about the Anaheim mission? It was a rich mission. Plenty of California coastline. It has been split at least twice since my mission. We baptized about 100 people a month. It covered 13 stakes from Fullerton to San Clemente. (Derek). I think The Lord has never stopped blessing me. A wonderful wife, 4 wonderful children, a grandchild. As well as more confidence, gospel knowledge and strong testimony. (Derek). Any advice/testimony for pre-missionaries going to Anaheim? We were able to go to the Newport temple once a quarter. The members of Orange County asked President Hinckley if they could build a temple and he said no because of the LA temple. They then asked if they could build it if they paid for it. The members of all of the stakes in Orange County got together and made this fund that they paid for the temple. I heard that three wealthy members went to President Hinckley afterwards and said that they were willing to pay for the temple, but he told them no and it had to come from the members. People complained saying they didn’t want a white temple because it would distract people driving on the freeway and the city told them that they couldn’t use the white marble they had already bought. The members fasted and it turned out that there was a building being built with the exact amount of stone but a different color, so they were able to switch them. It’s one of the tiny miracles of that temple. It’s one of my favorite temples to go to. It has this very homey feel. The Anaheim mission has eight languages that missionaries spoke. English and Spanish had the most. We also had Tonga, Samoan, Korean, Vietnamese, ASL, and Mandarin. Since then I don’t know if they’ve added more, but it was very unique. The Anaheim area has really strong communities and people that have gathered from all over the world. Driving through the cities you can see that everyone is Korean. Other cities will have everyone speaking only Spanish. I know that most of the people I met were from lots of different places in Mexico. A smaller percentage were from central and south america. The weather there is awesome. It was pretty mild. The summers did get up to 100 in the summer, but the coast is a lot more temperate. The winter got to low 40’s. I think a lot of sisters ride bikes now, but when I was there the sisters only drove cars. We would live maybe ten minutes away from our area, so we would drive to our area, park, and walk most of the day. It was nice to be in the neighborhoods and get to know all of the streets. Disneyland is in the mission. Anaheim Angels stadium is there too. We never went to Disneyland, but one of my areas had it included and there was a big splotch on the map saying to stay away. We planned to go around it all day. Every night we could see the fireworks as we drove home. A lot of people asked me if we spoke with a lot of Disneyland tourists. I was in one area for nine months and we never spoke to tourists. I think it’s because they mostly stay in their hotels and then stay in the boundaries of Disneyland. Sometimes I wondered if we could have reached out to tourists, but we were pretty busy with all of the Spanish speakers in our area. The Anaheim is the third smallest in the world behind temple square and behind Long Beach. We cover most of Orange County, and there is a huge range of diversity in the mission. It is extremely diverse in Orange County. There is a huge variance in levels of living the gospel as well. There are really strong members of the church that live it completely and it goes down from there. We have several languages in our mission. We have a lot of Vietnamese, Chinese, and Korean. There are a lot of Persian, Arabic, and Indian people. You meet Jews every now and then. You can get any kind of food. There is the fabulously wealthy Newport Beach area and Kobe Bryant lives there. There is also the ghetto where there are gunshots all of the time. There is just a huge range of people living in the mission. The missionaries themselves are very diverse. There is the beach, forests, lakes, public libraries. California just has everything. I served Korean speaking. so I got to go everywhere in the mission. It was hard not crossing mission boundaries sometimes when members wanted to take us to a restaurant just across the street from the mission boundaries. I loved teaching English classes every week to try to find more people to teach. We tried to teach English and help them learn gospel principles as well. I remember cooperating with the Chinese elders. We had a lot of fun together and ate a lot of different kinds of foods. The members were very generous. Investigators we would meet were so nice to us. Of course there were people who weren’t nice to us, but a lot of people were so nice to us and would invite us in to eat their delicious food. There were Vietnamese speaking missionaries that we would partner with as well. I miss California. One of my previous companion’s dad served in our mission, but it was just one big mission at the time. I do know that Anaheim was the headquarters of that big mission. The Anaheim mission is located in southern california in the northern part of Orange county. It has a lot of languages, it includes one of the only ASL missions. We have Korean, Vietnamese, and Spanish as well. It’s a very diverse part of the country. You can knock at doors in a neighborhood and meet people from all different races and backgrounds. The Wards are pretty amazing. I was able to serve in four different wards. The only branches in the mission are language branches. There are a lot of wards, and a lot of people to help with the work. There are also a lot of members to reactivate as well. Use the members to help you find people to teach! Members are the best missionaries. The Newport Beach temple is the closest temple to the mission. It actually used to be a part of the Anaheim mission, but recently the Anaheim mission split to form the Irvine mission because the church is growing so much. This made the Anaheim mission one of the smallest in the world. It was really easy to get to know your area because of how small they are. You get to know the people, the areas, and the culture very well. In your mission you learn how to use resources. Occasionally, the mission as a whole would be able to attend the temple together, with the goal of bringing recent converts, other members, and investigators to the temple. Mission Presidents just love you (their missionaries) so much. They show you their love right away, whether you have one president or another. The transition between presidents for us was unique to everybody, but it is a chance to learn and grow from both. Help your mission president by doing the best you can to be awesome! These things will bless not only him, but you, your companion, the mission , and your investigator. The first question I have to answer is this: No, we did not go to Disneyland! I could see the fireworks from my apartment for a good part of my mission. The Anaheim mission is one of the smallest in North America. It takes about 25 minutes to drive from one end to the other. My areas were 10 minutes wide at most, and I had a car for most of my mission. However, there were millions and millions of people within the area. I had one area that was 4 blocks by 4 blocks, with each block absolutely packed with apartment buildings. There were probably enough people in that small area to be triple the size of Provo, UT. We had missionaries who spoke English, Spanish, Vietnamese, Korean, Tongan, Samoan, and ASL. In the Anaheim, if you were called to serve in a language, you stuck with that Language. I only had two or three lessons in English during the whole mission, and I spent most of my time speaking Spanish. There were several stakes in that small geogpraphic area. Because of the large Spanish Speaking population there was actually a whole Spanish Speaking Stake. The Newport Beach temple was the closest temple there. It was just outside mission boundaries, but we were able to attend every once in awhile.